An executive completely refurnished and decorated first floor apartment lies approximately 1 mile to the west of the city centre and is just a 5 minute walk to Murrayfield Stadium. On the site of an old distillery, Roseburn Maltings is located just west of the city centre, perfect for those wishing to stay in a quieter part of town but still within easy reach of the city centre's main attractions. Haymarket railway station is less than half a mile away, whilst continuing west of the property takes you out to Edinburgh International Airport and the city by-pass, which in turn has links to the M8 and M9 motorway networks. There are a good number of local shops in the vicinity including a Tesco Metro store at the end of the street. Further afield there is Craigleith Retail Park, with Sainsbury's, Boots, Marks & Spencer & Nike. 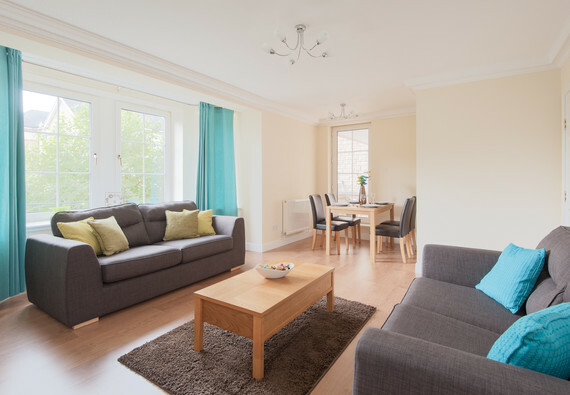 The apartment boasts a light and spacious open plan living and dining area with views to the Pentland Hills and French window opening up to a balcony with table and chairs for 4 guests. The living area is complete with TV, DVD player and wireless internet access for guests use. The breakfasting kitchen is fully equipped and complete with integrated appliances. The master bedroom has an en-suite shower room and both bedrooms benefit from built-in wardrobes. The allocated parking space makes this an ideal property for the busy professional. There are also landscaped communal gardens and a childrens play park for families. Entrance to the building is via a secure communal entrance system and there is a lift giving access to all floors. Accessibility statement This property is on the first floor but benefits from a lift. Lovely spacious appartment. Well equipped and clean. Situated near the team and in a quiet area.... Would definitely recommend to others. Well worth the money. Had a brilliant few days. Thank you for taking the time to post your feedback. Its great to hear that the apartment was well equipped and clean for your group and that you really enjoyed your stay with us. We enjoyed a very pleasant stay at this lovely apartment that was recommended by friends who had stayed in it last summer. We travelled to Edinburgh by car so the private parking space was a great help and free parking in a few of the cities car parks was also useful. The apartment is very well decorated, well equipped and everything is of a high standard. There are 2 bathrooms so no problem when everyone needs a shower. Good kitchen facilities with a small breakfast bar and a separate dining table in the living area where we all ate together. There was also a balcony with a table and chairs which we enjoyed when the weather was nice. It also has super quick WiFi and free view television which was great. There are lots of small shops and take away outlets within walking distance. Bus services run very regularly into the city center or to the airport. Murrayfield stadium is also very close by and we went to see the rugby there. It was a great place as a base for exploring and we would definitely stay there again. The flat was well presented, clean and fully equipped. <br />It was in a great central location to restaurants, airport and many facilities in Edinburgh. <br />I would definitely recommend this flat to others.